No-one wants to talk about business all of the time so whatever reason you have learnt sign language for, it is always worth expanding your vocabulary so you can talk about more light-hearted things. And what is more likely to bring a smile to your face than holidays? But of course, if you are going to chat about holidays, people will ask how you are going to get there so you will need to know words for various modes of transport too. This section covers descriptions of basic vocabulary to do with transport and holidays. All of the signs described below are in British Sign Language. So, here are a few descriptions of how to say various words for modes of transport in British Sign Language. Starting off simply, the sign for car is represented simply by miming moving a steering wheel. The word bus is said by moving the first and index finger up and down with the hand held at the head. 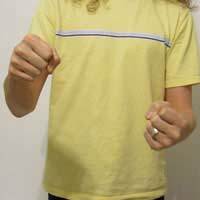 To say train you hold your fist by the side of your body and pump it outwards in a forward motion. For taxi, you hold your hand near your head and click your thumb and first finger. To say aeroplane you hold out the little finger and thumb of the prime hand and move it forward through the air. Ferry is represented by holding the hands with the tips of the fingers together and pushing them, as if through water. And to say tube, as in the underground, you hold the first finger of the prime hand out and push it under the second hand. It is likely that you will want to tell people about the weather on your holidays - this is covered in a separate article. But you may also want to say what activities you did while you were away. This could include skiing - sign is represented by holding fists into body and making circles with the arms as if using ski pole - or swimming- the sign is made by paddling with the arms. You may wish to say which part of a country you went to on holiday. To say east you hold your right hand upwards with the palm facing left and move the hand right. To say west you do the same but move the hand to the left. North is said by holding the primary hand face down and then moving it upwards. South is said by doing the same but moving it downwards. Common countries' names which might be needed include America which is represented by interlocking the fingers, holding the hands out horizontally and moving them in a circle. To say Spain, you hold your first two fingers against the chest, with the little finger side closest to the chest, then flip them over so the thumb side is closest to the chest. Realistically, many of the words you will need to have a conversation about holidays will be included in other sections, because many of them, such as asking for directions while away, will be the same as if you were at home. If you do not know the name of the country you have visited in sign language, remember with proper nouns especially there is always the option to fingerspell them which should be fairly easy for countries. But above all, as with any set of vocabulary, the most important thing to do is to practise to keep the words fresh in your mind ready for when you next need them.